When the internet first became available to consumers, video content was a luxury that most websites and content publishers didn’t worry about. When the top speed for home internet service was 56k, a grainy, 60-second video would take 10 minutes to download and require every bit of bandwidth. Now, content producers and advertisers can show fullscreen, HD video in real time without even stopping to buffer. These conditions have led to a rise in the consumption of video content and data suggests it will lead to a huge shift in the way people use the internet. Cisco released their Cisco’s Visual Networking Index which forecast IP traffic and service adoption based upon independent analyst forecasts and real-world mobile data usage studies. One of the key takeaways from the research is that online video will account for 80 percent of all web traffic by 2019, up from 67 percent in 2014. Use of the internet will continue to grow at incredible rates at the computers advance and consumers find new ways to integrate technology into their daily lives. According to the report, global IP traffic will reach 168 exabytes per month by 2019, up from 59.9 exabytes per month in 2014. To show how much the internet has grown, think of it this way: In 2019, nearly as much traffic will traverse global IP networks than all prior “Internet years” combined (from 1984 to the end of 2013). In terms of percentage growth, annual global Internet traffic is expected to grow at 26 percent rate. Boosted by “increases in Internet users, personal devices and machine-to-machine (M2M) connections, faster broadband speeds, and the adoption of advanced video services”, daily traffic forecast to grow from 1.4 exabytes per day this year (1 exabyte = 1 billion billion bytes) to 4.5 exabytes per day in 2019. The growth for internet video will be shared by consumers and businesses. The report noted that consumer IP video traffic will be 84 percent of consumer IP traffic by 2019, up from 75 percent in 2014. 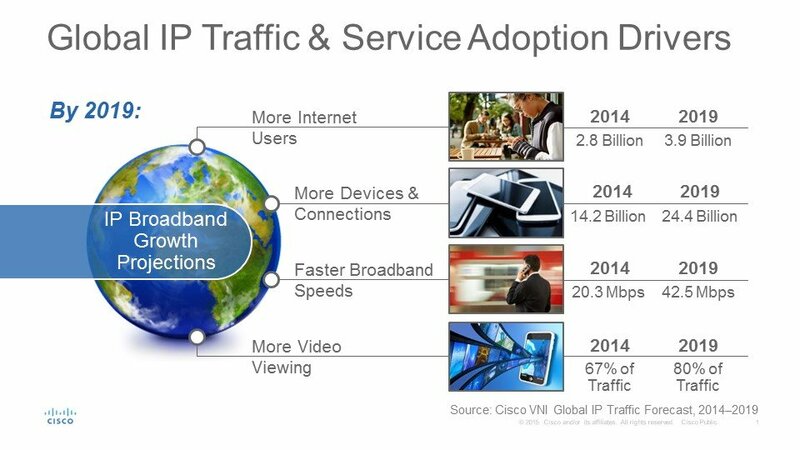 Similarly, business IP video traffic will be 63 percent of business IP traffic by 2019, up from 36 percent in 2014. The projected jump in business video content should let the business owners see how important it is to expand their video offerings. The growing consumption of video content creates multiple opportunities for content publishers and marketers. The growing amount of time spent watching videos means that content producers should be thinking of ways to add more video content to their website and to market their website’s written content to people watching online video. One way website owners and marketers can do this is by using channels like YouTube, Vimeo or Dailymotion to get their content shown to a wider audience and then link back to the main site. For marketers and advertisers, the online video situations creates an opportunity to target their prime audience by their video consumption habits. As video content went from broadcast channels (e.g. ABC or CBS), then to cable channels (e.g. Comedy Central or HGTV) to the current set of online video provides (e.g. YouTube), the targeting has gotten more specific. This makes it much easier for retailers who sell niche products to put their ads in the best place to find their target audience. For example, a manufacturer who sells custom cookie cutters can place video ads on YouTube shows about how to make crazy kitchen creations, rather than showing the ad on a more generic TV cooking show. It’s also important to note that this report doesn’t mean that people won’t be looking for written content or images (like infographics). This report measured the projected growth in the amount of data sent. Video content (especially HD movies and TV shows) take of exponentially more bandwidth than an article on a blog so it’s to be expected that video will take up more data as more people watch, more videos at a higher quality. So there will still be a need for diverse content on brand websites. For more recent news about the future of the internet, read this article on projected growth in the market of the Internet of Things.